Pani Jurek's project refers to the furniture collection, among which there are the old “zydels”, chairs and armchairs. In the museum store, zydels with an unobvious long seat attracted my attention. It's hard to say who invented this lengthening. I imagined that these chairs can be used to perform various household chores, and that such elongated seat would be great for work also today. 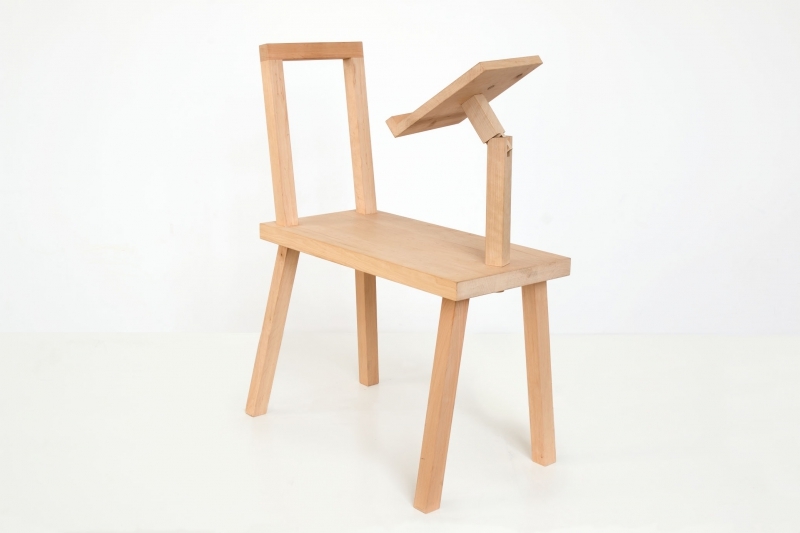 I designed the chair adapted to perform household tasks over 100 years later. The material, construction and method of combining elements of my chair refers to the traditional zydels. It includes a small removable panel that can be used as a place for a book, mobile device or plate. ZYYYDEL would be also perfect as a kind of kitchen board or as a shared place for reading books with child. “Zydel” is structurally the simplest form; consisting of the board seat with attached four rod-shaped legs and the backboard – the backrest made of a single board. The board seat, mostly in a trapezoidal shape (sometimes with beveled corners). The chairs with backrests spread in villages at the beginning of the twentieth century, previously were used by the wealthiest farmers.